I'm very excited to report a very special promotion going on at Spago Beverly Hills. One of my favorite restaurants, Spago is hosting "Dine LA" which is a Prix Fixe menu filled with amazing dishes that I'm told are not regularly on the menu. A portion of the proceeds go to Los Angeles Charities. Must try the pomegranate-orange martini AND the Ahi Tuna Cones....to die for (not on the menu, you have to ask for them) AND it's always a pleasure to see Wolfgang. Click pic for more info. Urban Oasis Cocktail Reception-Beverly Hills Hotel, Your Invited! 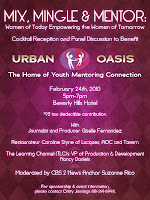 VIP Women's Event and Cocktail Reception at the Beverly Hills Hotel "Urban Oasis," moderated by my friend and Channel 2 Anchor Suzanne Rico. Great sponsors means great swagbags, see you there! I just came from a huge swag-product con- vention in Las Vegas and am excited to report there is some great new stuff out for 2010. It seems like product manufacturers stepped up there game in 2010 to compete and we the consumer have LUCKED out! 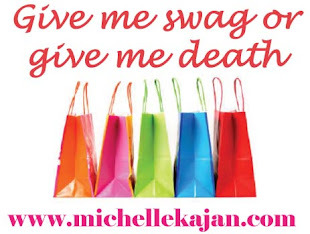 To see my photo diary of all the new swag click the images. I wanted to high light one of my favorite manufacturers who is behind the scenes designing and hand manufacturing some of Hollywood's most famous swag RS OWENS. RS OWENS IS responsible for making uber luxurious awards like THE OSCARS, THE Emmy's, THE MTV MUSIC AWARDS & THE AMERICAN IDOL awards to name a few. Think I'm joking? Check out these pics...these ARE the real deal. La la land is buzzing as tonight is the 67th Annual Golden Globes rain or shine (it's raining FYI.) The big suites this year: HBO's luxury lounge, GBK "Giving Back Lounge", Kari Feinstein's Style Lounge, Access Hollywood's "Stuff You Must" Lounge, The Boom Boom Baby Room and The Think PR 3rd Annual Pre Sundance Gifting Suite. A highlight at the Access Hollywood Lounge"Stuff You Must" was the CVS Reinventing Beauty Bar where celebs like Vanessa Hudgens, Stacy Keibler & Rumor Wilson, indulged and walked away with this swag bag full of skin care goodies! According to a Vanity Fair article by Jessica Flint, there is a Pre-Sundance Swag Suite in LA at the W Hotel to prepare celebrities for the main event in Park City, Utah. Where are the cool kids hanging out while in Park City you ask? Oakley's "Learn to Ride Event", Village at the Yard, FredSegalfun.com Style Lounge, and the T-Mobile Diner. New this year will be the Sephora Gifting Lounge as well as Nintendo's going to have a lounge. Click the VF logo to read the entire article! 2009 was an amazing year and flashed by with the blink of an eye. Looking towards the future my goal as your swag correspondent is to show you what's hottt and of course what's NOT. 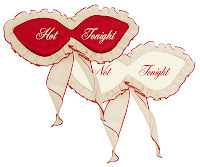 Every married gal in the know needs to invest in a pair of Mary Green's reversible "Hot tonight/ Not Tonight" luxurious eye shades. According to Vanity Fair Italy "Mary Green IS the queen of lingerie", would you question the queen? Another brilliant marketing idea is to create a like concept for your brand with your own "personalized messages," so easy...yet so creative!"